Chelsea secured their place by winning at Leicester in extra time on Sunday, as Southampton knocked out League One side Wigan. The ties will take place at Wembley on the weekend of 21-22 April. Wigan's defeat means it is an all-Premier League line-up. United are second, Tottenham fourth, Chelsea fifth and Southampton 18th. Tottenham, eight-time winners, last lifted the cup in 1991, while United's most recent triumph was under Louis van Gaal two seasons ago. 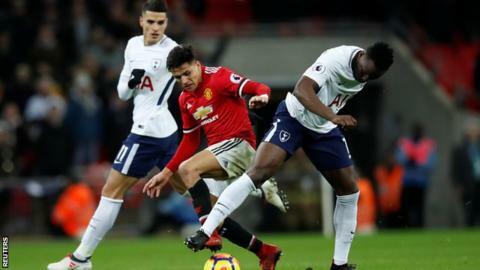 United were drawn at "home" in their semi-final, which means Spurs will be in the visitors' dressing room at Wembley - where they are playing their home games in the Premier League this season while White Hart Lane is rebuilt. Last year's runners-up Chelsea have won the trophy seven times, most recently in 2012, while Southampton - in the last four for the first time since 2003 - lifted it for the only time in 1976. Four clubs, one trophy - who needs it most? The FA Cup has once again answered those who claim it has lost its lustre and magic - one look at the semi-final line-up is the reply to the cynics. Southampton take on the role of underdogs while three of the Premier League's genuine superpowers will be fighting it out for their only chance of silverware this season. Conte will want victory to make amends for last season's final defeat by Arsenal that denied him a Premier League and FA Cup double in his first season at Stamford Bridge. It could also prove to be the perfect farewell with the growing expectation that the Italian will leave Chelsea at the end of the season. Mourinho, that serial accumulator of trophies, will now be eyeing the FA Cup as his response to those who have criticised him and Manchester United's sterile football this season, especially after the timid exit to Sevilla at the last-16 stage of the Champions League. He and United face a tough task against Spurs - who have already beaten them comfortably at Wembley in the Premier League this season - but he will relish the opportunity to prove once more that when the big occasion arrives he can plot the big result. Spurs' disappointing Champions League loss to Juventus once again posed the question of just how highly Pochettino and his team can be regarded until they have a trophy to their name. The FA Cup presents a perfect opportunity to put that right - but all four managers and clubs who will fight it out at Wembley on semi-final weekend have compelling reasons for wanting to win the famous old trophy.